Early Years: In "Shankars weekly" the name "Dass" was used in the cartoons - a name proposed by Shankar. Also the names O Sunny and KK Nair were used occasionally. During the Chinese aggression, cartoons were produced in "Deshabhimaani" using the name KK Nair. These cartoons were collected from Delhi and sent to Kerala by a staff of Chinese Embassy in New Delhi. Born on June 12, 1938. Father John Mathai, a Government servant. Mother Mariamma (Achiamma). Elder brothers: Kuriakose (Joy) who was a drawing master, Philip (Sadhu) worked with Aramco, Saudi Arabia. Younger sister Leelamma. Parents and siblings have passed away. Yesudasan belonged to the Kunnel Chackaleth family in Bharanikavu Village, Mavelikkara Taluk. Baptised in St Stephens Orthodox Church, Kattaanam and named Yesudasan, considering him to take priesthood when he grows up. He was called "Dasan" by everyone in his hometown. But when he grew up he wanted to be an engineer and not a priest. He dreamed at owning estates in Munnar and orange yards in Mysore by building roads, dams and bridges as an engineer. But he eventually landed up being cartoonist .Yesudasan himself says "I became a cartoonist by accident." American state secretary John Dallas dancing with an atom bomb was his first cartoon. This cartoon was published in 1955 in the satirical magazine "Ashoka" published from Kottayam. The editor was the well known writer Panthalam KP and the publisher was the owner of Ashoka Process Studio at Kottayam, Mr Pylee. As the copy of the magazine is not available, this cartoon has been sketched using the left hand and recreated. During a period cartoons were created using left hand and published in Malayala Manorama daily. These were signed "sunny". Yesudasan was very particular in signing in Malayalam in the cartoons and these used to stand apart from the usual decorative English names. "Chandhu" was a pocket cartoon started in 1959 in the Janyugam weekly. All characters in this were children. The naughty "Chandhu" instantly became popular among kids and elders as well. Along with Chandhu appeared Rajamma and Shamel. Even after joining Shanker's Weekly in 1963, this column was continued for some time. The name Chandhu was proposed by the then Janyugam editor Vaikkom Chandrashekaran Nair. Soon the hanky tied around Chandhu's neck was a fashion among kids. 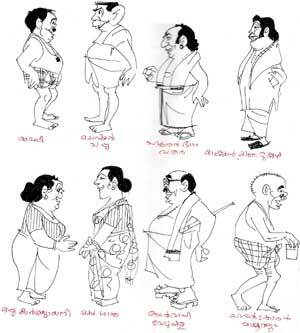 July 19, 1959: This date is milestone in the history of Malayalam cartoon journalism. 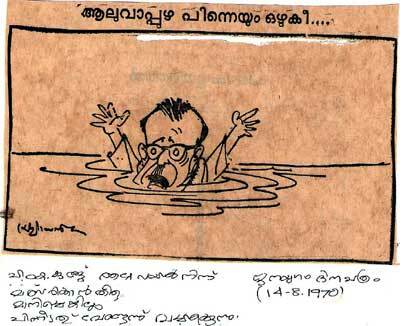 It was on this day that the first box cartoon "Kittumavan" appeared in Janayugam, a communist party newspaper. "Kittumavan" was a person who used to give his views on everything under the sun and became popular very soon. This column was started during the time of the liberation strike against the communist ministry lead by EM Shankaran Namboothirippadu. 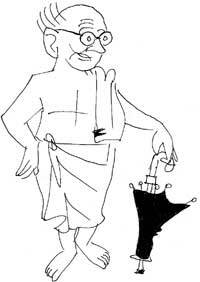 "Kittumavan"with an old broken and leaky umbrella was accompanied by several characters like Pylee, wife Karthiyani, daughter Shantha, Pacharan bhagavathy, big eared Pappu, story teller Kinathunkuzhi, neighbour Vellupilla, Mammonju etc. Kittumavan and Pylee became popular nicknames across Kerala. Kittumavan and Pylee were enacted during communist meetings and processions. Kittumavan and Pylee visited the medical college in Trivandrum and had conversations which was much talked about. The west gate of Trivandrum secretariat was the venue of serious discussions of politicians, journalists and government secretaries, every evening. This "west gate ministry" was instantly stopped after it was criticised by Kittumavan and Pylee remembers the old leaders. The name Kittumavan was suggested by Thengamam Balakrishnan, printer and publisher of Janayugam. 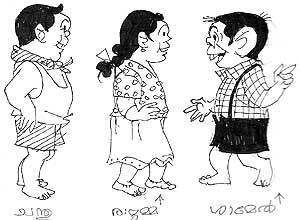 Kittumavan was the first ever box cartoons in the Malayalam dailies. The readers of Janayugam were more attracted to the looks and appearance of more than 15 characters in Kittumavan. 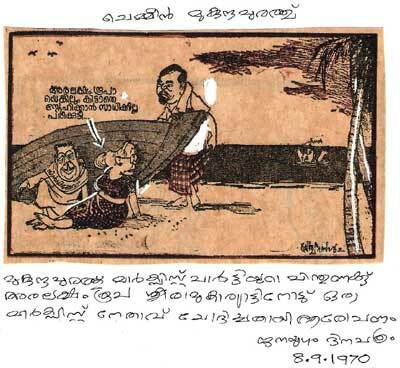 This box cartoon continued even after Yesudasan's resignation in 1963 after which he joined the "Shankar's Weekly". Yesudasan accepted Janayugam's proposal to continue with Kittumavan. The old sketches were reproduced with the captions coined by the Janayugam editorial. As Yesudasan grew up with Janayugam and was interested, he had to bide happily with their proposal. 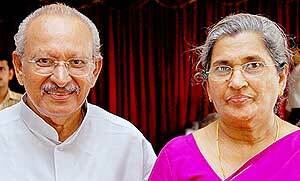 Family: Wife Mercy native of Thazhakkara, Mavelikkara, brought up and studied in Bombay. Worked in Accounts Department of Central Railways before marriage. Eldest son Sanu Y Das is mechanical engineer, working as Purchase Manager in Aban, Chennai. Married to Jaya and has two children Sanju and Sneha. Second son Sethu Das is the Founder-president of Friends of Tibet and Co-founder of Design & People. Youngest son Suku Dass is an architect working independently based at Kochi with wife Alexy and son Aadi. He is also the Co-founder of Design and People. Education: Began his education at a private tutor near his house at Valuthura, Bharanikkavu, Mavelikkara Taluk. Joined Class I in Government school, Bharanikkavu. Enjoyed drawing birds, fishes and flowers on the mud floor at his school. Thus started drawings from the school floor at Bharanikkavu. Later was transferred to St George School, Edappally as his father who was a Village officer had a transfer to Thrikkakara. And so stayed in a rented house near the Thrikkakara temple. Joined Class II in St George School, Edappally and continued till Class IV. Learned up to Class VII in Government school, Devankulangara, near Edappally. Later joined Poppais School, Kattanam when his father was transferred to Bharanikkavu, Mavelikkara. Continued studies for three years in this school and passed SSLC from here in the year 1953. Yesudasan says that the blackboard in Poppais School helped him in developing his drawing skills. Some teachers also used to make him draw during their lectures. His mother used to Stitch bed sheets and pillow cover at their house on which he drew flowers and animals over which his mother used to run multi colour threads. 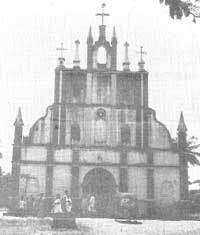 Joined Cathollate College, Pathanamthitta in 1953 for BSc Mathematics. Then the Principal was Nicholas, a Russian refugee from America. His Wife was a dentist. 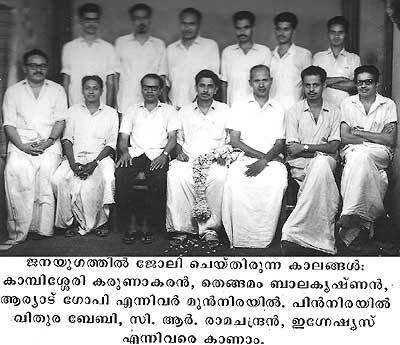 Prof Ninan Abraham, Chacko sir from Chenganoor, Mathen Tharakan from Puthankaavu were principals during this period. Along with academics he became interested in arts and was the secretary of the Arts club. The joint secretary was late MM Abraham, the founder Chairman of Aban Group of companies. In his first year in this college he received certificate and medal for the best student. In sports his favourite games were badminton and football, but his interest in sports during the school days disappeared as he reached college. After securing his degree, he wanted to do post graduation and so he attained an admission in Christ College, Kanpur with the help received from Prof Ninan Abraham, former principal of Cathollate College. During this time his interest shifted from studies to cartooning. Nehru, Mavo, Pattom Thanupillai, Annadurai etc had taken place in my brain in place of mathematics. 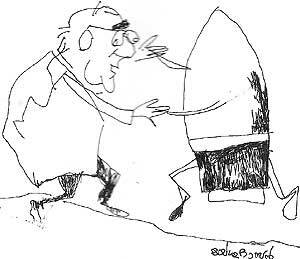 In the field of Journlism: Yesudasan joined Janayugam as staff cartoonist in 1961. 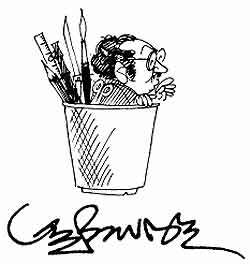 Janayugam was the first daily in Malayalam to appoint a staff cartoonist. 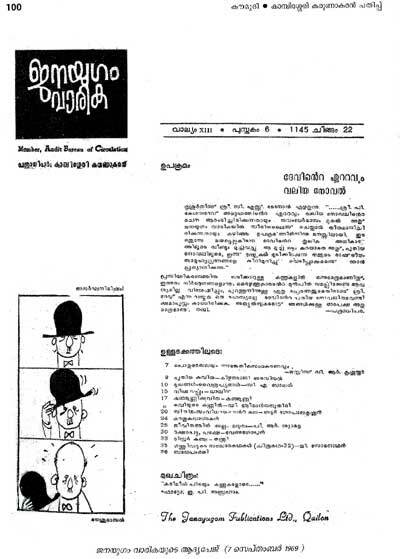 The cartoons Kittumavan in Janyaugam daily and Chandhu in Janyugam weekly appeared in Janyugam even before Yesudasan officially joined Janayugam. Janayugam Staff Cartoonist Yesudasan (Left) with co-workers. Kambissery Karunakaran, Thengaman Balakrishnan, Aryad Gopi, Vithura Baby, CR Ramachandran, Ignasius and others. Entry to Janyaugam was made through the then Chief editor of Janayugam N Gopinathan Nair. As per the advice of Gopichettan met VS Achuthananadan, one of the then directors of Janayugam at Trivandrum. But the appointment was not spontaneous. One day Kambisseri Karunakaran and PK Vasudevan came to Yesudasan s home and invited him to Janayugam. Even though Yesudasan did not belong to family with communist background his father did not show any resent in joining Janayugam.His father seeked the opinion of his friend headmaster Mathunni sir who was a strong catholic and anti communist who had every chance of opposing but he said "As Dasan is interested in cartoon let him join janayugam". He then shifted to Kollam and rented a room at the house of RS Babu (editorial board member of Deshabhimaani) for Rupees ten. The first political cartoon"a horse" appeared in janyugam in mid 1959, even before joining Janayugam. During the period of aggression against EMS ministry, the then leader of opposition Mannathu Padmanbhan made a statement "I will tie my battle horse on the legs of the table of EMS". This statement was well noted and was the subject of Yesudasan's cartoon depicting Mannathu Padmanabhan standing on a wooden horse. This appeared in the front page of Janayugam and was later reproduced in several communist party publications in various languages. Thus this cartoon gained prominence. The slogan "look at the wooden horse" was used in processions. Finally when the strike was a success a wooden horse was presented to Mannathu Padmanbhan by MV George during the grand reception at Kottayam. Eventhough not a Communist Party member, Yesudasan continued using his brush for Janayugam. His father also supported him as communisam was vary far away to him. Joined Janayugam in 1961 as staff cartoonist and worked here for two years. The political cartoons in the daily and box cartoons Kittumavan and Chandhu in Weekly slowly grew up.This help in meeting and getting associated with political leaders, journalists, people from filmdom and social activists. At a later stage yesudasan came to know that OV Vijayan resigned from "Shankar's Weekly" to join the "Patriot"an English daily of Eduthitta Narayanan. Yesudasan tried his best for that post and inally joined Shankars Weekly in 1963. It was from Shankar that he realised that he had wrong perceptions on cartoon. Yesdasan says "Shankar made me fly into the amazing world of cartoons."